After the many anti-government demonstrations following the sacking of ex-Deputy Prime Minister Anwar Ibrahim, the Reformists in Malaysia were warned by the authorities not to hold anymore 'illegal' assemblies. 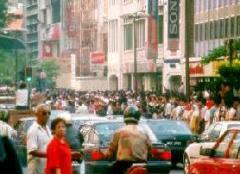 Not wishing to break the law, Reform movement organisers ‘invited’ Malaysians to join them ‘shopping’ in downtown Kuala Lumpur on Saturday, October 10th, 1998. It was a hot, sunny late afternoon, and as the significant other and I proceeded to the Indian Mosque district from the Central Market, we could already see small groups of four or five policemen, beating the sidewalks or ominously hovering at street junctions. But traffic seemed normal and people appeared to going about their usual business, as if this was going to be just another ordinary Saturday afternoon. It was not to be just an ordinary Saturday. This Saturday was to be one of those special days that history claims for its own. As we made our way along the Saturday flea market in the winding, narrow back alleys of the Indian Mosque district, we couldn’t help noticing a hum in the air. It could have been the distant honking of traffic from nearby Jalan TAR. "The traffic must be really bad there today," I thought to myself. But it became more than a hum. By the time we were nearing Campbell Road and proceeded to turn into Jalan TAR, the hum grew louder and louder until it became a roar. And what a breathtaking sight we saw when we turned that junction! Foreign wire news reports I read later said it was at least three kilometres long. But from where I was, it seemed that all along Jalan TAR, for as far as the eye could see, there were thousands of people lining the pavements, chanting, singing, laughing, cheering, clapping. Men. Women. Children. Students. Couples. Middle-aged housewives. Elderly pensioners. Veiled Muslim girls. Rockers in leather jackets. 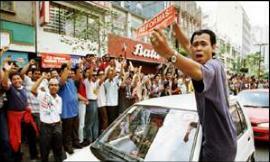 Some were waving posters of Anwar Ibrahim, others made do with magazine covers with his photographs. There were brightly painted cloth banners, still others just made do with home-made placards scrawled with marker pens on cheap manila cardboard. But they all had the same messages - "REFORMASI" "KAMI TUNTUT KEADILAN" ("We demand justice") "REFORMASI" "UNDUR MAHATHIR" ("Mahathir resign") "REFORMASI" "KEADILAN" ("Justice") "REFORMASI". How many people were there? Media estimates varied from 10,000 to 50,000. I would think that there were certainly at least many tens of thousands along Jalan TAR - maybe less after evening prayers later that evening. And I’m not even counting the cars. A demonstrator remarked excitedly "Even if we went to the Bukit Jalil Commonwealth stadium, it wouldn’t be enough to hold us all!" 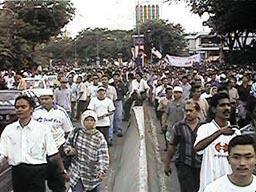 I dare the government to repeat its previous cliams that all these demonstrators were foreigners! And the persistant honking! 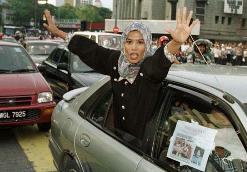 No, this wasn’t your usual Malaysian motorist’s love call to the car in front of him - the traffic was moving smoothly. The vehicles were honking at us on the pavement! After a while you could distinguish a certain ryhtmn as well - four short honks, repeated at intervals. Honk-honk-honk-honk. RE-FOR-MA-SI! The passengers in the cars unfurled their own posters, pictures and messages, stretching their bodies out of their car windows and waving them at pedestrians. Some shook hands with the pedestrians, but most exchanged that gesture that the Reformists have made their salute - the thumbs-up. And the crowds on the pavement clapped and cheered as this happy convoy made its way up Jalan TAR. One middle-aged lady in a burgundy Proton car saw the white ribbon I was wearing on my jacket and bellowed out "Reformasi!" as she smiled broadly. I shot back a thumbs-up and returned her smile - and for that instant we knew that there was an instant bond. I got that feeling a lot today - that instant bond, with total strangers, yet much stronger than anything I’ve felt with some people I would call friends. As we were moving along the road towards Independence Square, I could see that the organisers were taking great pains to make sure that traffic flowed smoothly and people were safe. I could see individuals along the road diligently directing traffic, persuading crowds back when they spilled too much onto the road, getting cars to move along when the drivers were too engrossed shaking hands with pedestrians. I was pleasantly surprised that the uniformed police were far from the grim, stern-faced guardians of the law last week. There were groups of two or three of them along the road, leaning against pillars, arms folded, smiling at the crowds - yes, smiling! In fact, I can’t say that I’ve ever seen so many smiling policemen. One sixty-year old man I met said one of the policemen even struck up a conversation with him. "What can we do?" the policeman had complained. "There are too many of them! So if they don’t start any trouble, don’t damage public property, we’ll leave them alone." The old man remarked "Cops are ordinary folks like us. It’s only the top people who are cruel." And he let slip a revelation. 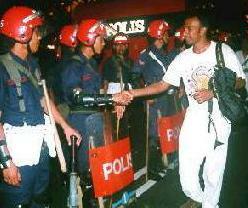 "And its not just cops - it’s like that with most of us in UMNO." I met a journalist friend of mine along the way. "This is wonderful," he said. "I couldn’t believe Malaysians could do this. But we have. And perhaps there is hope yet for us." I subsequently heard that he was assaulted by two policemen later that day. As the evening wore on, the crowd proceeded towards the direction of the National Mosque - a mass of many thousands of people converging to perform their evening prayers. 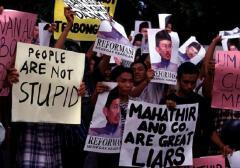 The cheers of "Reformasi!" and "Allahuakbar!" (‘Allah is Great!’) ringed Independence Square again, like it did last September 20th. We saw three or four police trucks waiting in front of the Federal High Court building - but, this time, no long columns of red helmets, shields and batons barring the way. And where were the riot police? Safely huddled inside their caged trucks! At the junction leading towards the National Mosque, police crowd control consisted of two petite, young and rather pretty female officers - surrounded by this sea of big, perhaps angry young men. The officers, of course, tried to play their part to the hilt, looking seriously and sternly at the crowd - but one of them couldn’t stop herself from letting out a giggle when one of the demonstrators teased "Please look after our safety, girls! And please don’t hit us - it hurts!" The fountain located at the entrance of the tunnel below the British Council was awash with people - literally. From being a rather ugly and perhaps over-expensive ornament, that fountain was transformed into a refuge where the faithful could cleanse themselves for prayer - dozens of people were performing their wudu’ (ablutions) there, expecting the washing area in the National Mosque to be already congested with bodies. But perhaps the most stirring moment for me that day was when we entered the tunnel leading to the mosque. Roars of "Reformasi!" reverberated as the crowd entered the tunnel, the acoustics amplifying the sound until it hit you like a wall, like the blast from an explosion. I spent a few minutes just standing motionless in that tunnel - "Reformasi!" "Reformasi!" "Reformasi!" echoing in my ears for many minutes after I left. The crowd came back along that same tunnel - echoing the same call - after prayers had been performed. They were filled with renewed zeal, marching to that Square that was the scene of so much history in just these past few weeks, and so aptly named - Independence Square. 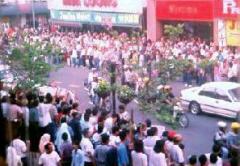 The crowd reached the Federal High Court building a few minutes before 8.00 p.m. 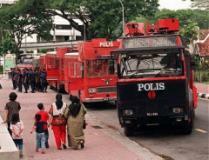 There were already FRU trucks and the infamous water cannon barring the way back to Jalan TAR. So people did the most logical thing - they just sat down on the road! 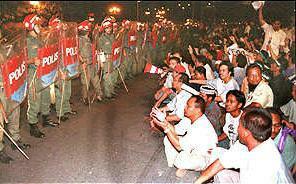 A sit-in protest - no one can accuse you of starting violence when you’re sitting on the road, cross-legged in typical Malaysian style! A small group of young men in leather jackets and short military crops - I don’t know who they were - tried to pull down the barricades along the field and urged the crowd to follow them. But it was obvious that the organisers were well-prepared for any trouble-makers - the youths were immediately surrounded by the crowd and ordered to get back on the road, sit down and join the rest. The crowd even put the barricades up again. When the clock tower of the High Court building struck eight, the whole crowd let out a roar of "Allahuakbar!". They were not budging and the situation was tense - the police certainly seemed no longer in the smiling mood they were in the afternoon. There were some heated negotiations going on immediately under the clock tower with some senior police officers, while the crowd continued chanting and singing. There was a round of cheers when a line of young women in tudungs (veils) moved through the crowd, in single-file, bearing a poster of Anwar. And as I sat there, I couldn’t help but notice Bukit Aman Police Heaquarters towering above us just a few hundred metres away. One or two of the floors were still lit up on the dark monolith, and you could even just about see individuals peering from the lit windows. I wondered if Anwar was there, seeing all of this - and what thoughts would be running through my head if I were him. At about 8:10 pm the headlights of the water-cannon were ominously switched on. The police made a chilling announcement. "Women and children are ordered to leave the area. We are giving you two minutes to disperse"
Almost at the very second the announcement was over, the call to the Isha’ night prayers began from the nearby Jamek Mosque. As the musical call to prayer echoed in the stillness of the night, an eerie quiet hung over the whole of Independence Square. Almost everyone was still. As the call faded into silence, the crowd still did not move. I could hear a young Indian man talking behind one of the pillars of the building, either to a handphone or perhaps a walky talkie " It’s still stand-off. The Officer-in-Command wants to give them another 15 minutes. Stand by." But soon, the organisers told the crowd to go home - their point had been made. 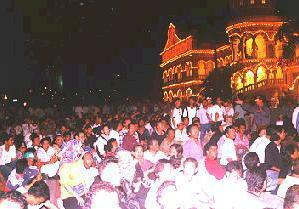 The mass of people turned away and dispersed into the city as the clock tower struck 8:30. Despite the attacks on demonstrators in the weeks before, despite the warnings almost every day this week that the authorities would crack down on any form of demonstration, despite the fear, despite the threats, despite the solemn pronouncements by the powers-that-be that the Reformasi movement is dead - tens of thousands of Malaysians came out today - defiant and free. I have never in my life been more proud to be Malaysian than I am at this moment in history.